Circa Restoration Studio is opening tomorrow at 16 Bridge Square. A couple of weeks ago we helped the Lisa Ebert, who is opening the antique shop and furniture restoration studio, prepare to move into her new space. 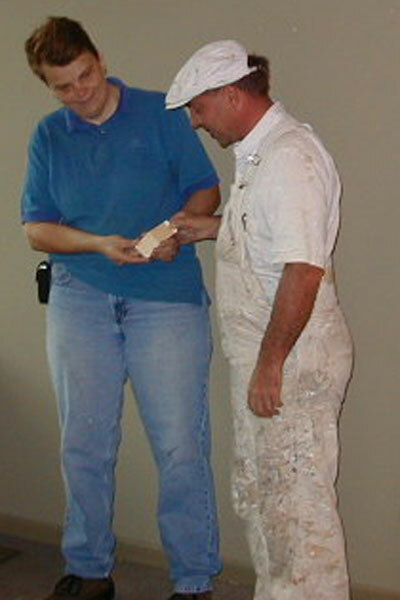 Here are Lisa and the Bart DeMalignon–the building’s owner–inspecting the new color for the studio. The new gold color will really show off her oak, cherry, and mahogany pieces. We had to fill some holes in the walls. I hope you will visit Lisa in her new shop. 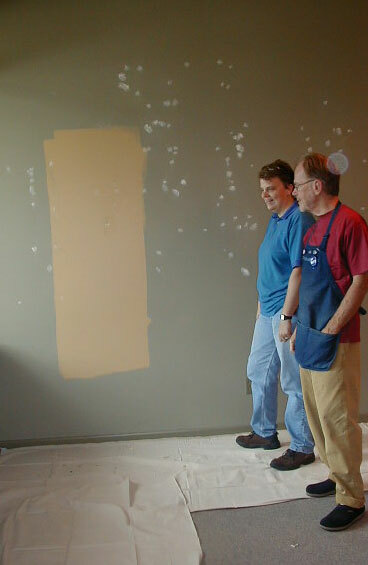 Circa Restoration Studio will particpate in the Northfield Art Crawl Friday, October 1st, from 7-9 p.m.
Below Cindy Brooks applies the first coat of eggshell finish latex enamel over our spackled and primed repair areas. When Carleton College Benedict Distinguished Visiting Professor of Economics Tammy Feldman purchased this house at 315 Elm Street the walls and woodwork had all been painted gray. The lower ceiling in this room was still a cool teal from the original 1950s color scheme. From Cambridge, Massachusetts, Tammy brought colors that her decorator friend had helped her choose over two years ago. Note the Summerdale Gold on the ceiling. The woodwork has all been primed with Zinsser Oderless Oil bonding primer, followed by two coats of Moore’s Satin Impervo in “White Chocolate.” Here we have the new red birch hardwood floors protected with plastic and heavy canvas. In the the East facing bedroom Tammy chose Benjamin Moore “Timothy Straw,” again with the White Chocolate accent on the woodwork. 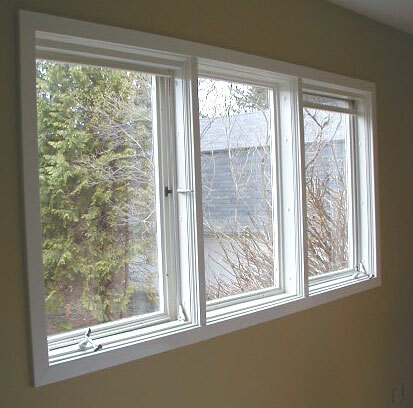 Note the Pella windows with oversized cranks and built-in screens which roll up into the wall when not in use. We are very excited to help Tammy get comfortable in her first house. Later this summer we will be washing and sealing the exterior redwood. 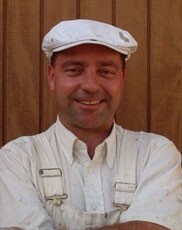 areful Painting was incorporated on December 31st of 2003. Two businesses are housed within the corporate structure–Careful Painting, a full-service painting contractor; andPainter’s Toolbox, an online retailer of painting tools and supplies. 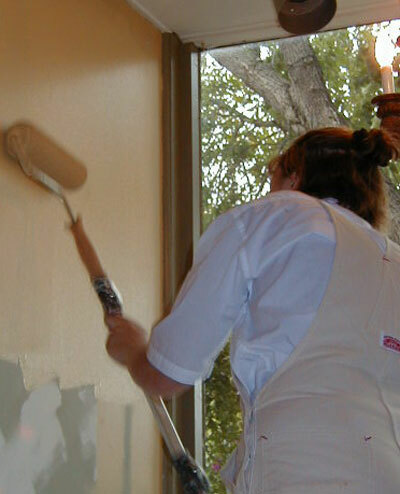 Since this is the Careful Painting website, I will proceed to describe some of the painting and decorating services that we provide. 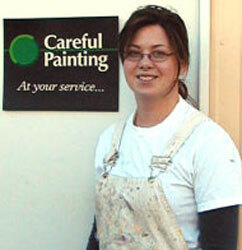 Currently there are two of us at Careful Painting: me (Mark Lange), and Nicole Hernke. Nicole helps out two days a week while studying Interior Design at Dakota County Technical College in Rosemount. We will be hiring more help for the Summer. 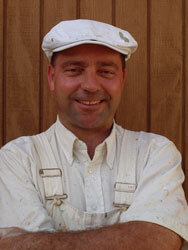 We do residential and light commercial painting; staining and finishing of woodwork; plaster and drywall repair and texturing; water damage repair, including the mold removal service (find details at https://www.bustmold.com/locations/ottawa/); custom stain matching; color matching; wallpaper removal; wallpaper installation; washing and pressure-washing; preparation and repainting of very old and weathered wooden buildings; waterproofing cement walls; repainting of prefinished siding; painting cement board, stucco, and concrete; restoration of interior wooden interior window sashes which have discolored due to moisture condensation; custom decorative effects such as interior clouds and painted stripes; wallpaper border installation; kitchen cabinet washing and refinishing; priming and painting of new Gypsum Board in new construction; deck cleaning, stripping, sealing, staining, and refinishing; window glazing and interior and exterior caulking; woodwork washing and enameling. Brush, roller, and spray painting. 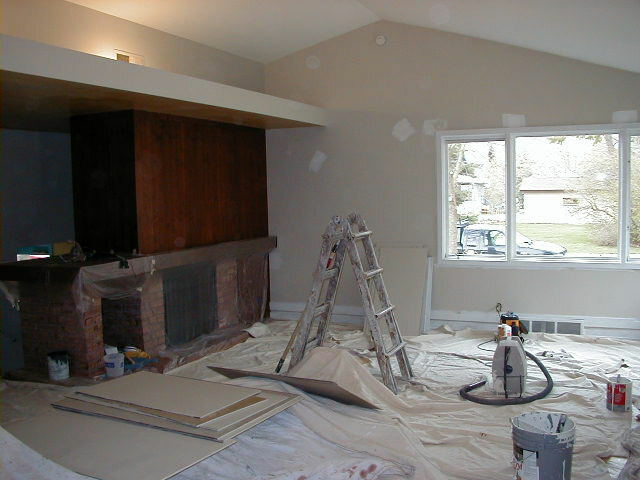 Interior and exterior painting. House painting with both oil and waterborne paints. 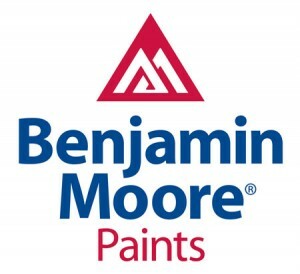 We use mainly Benjamin Moore and Diamond Vogel paints. We paint in Northfield, Waterford, Randolph, Cannon Falls, Vasa, Welch, Hampton, Hastings, Afton, Lakeland, Stillwater, Stanton, Dennison, Sogn, Wastedo, Kenyon, Skyberg, Bombay, Nerstrand, Faribault, Cannon City, Dundas, Shieldsville, Millersburg, Webster, Hazelwood, Castle Rock, Farmington, and in Hudson, North Hudson, and Prescott, Wisconsin. While I have had many chances to work in the Cities, over the years I have preferred to work in smaller towns. Earlier in our history we did jobs in St. Croix Falls, Wolf Creek, Osceola, New Richmond, Star Prairie, Somerset, Houlton, Bayport, Marine-On-St.-Croix, Scandia, Withrow, Hugo, and Lake Elmo. Most of those jobs are still looking good after many years, and we do continue to travel to those area for special customers. Small town life is very handy. From our central shop at 308 Water Street North in Northfield (two doors South of the Northfield Foundry) we can easily serve all of Northfield and the surrounding area. Carpenters find it easy to drop off woodwork to be finished prior to installation. We receive regular shipments of the various supplies that we need to do all the preparation and finishing, and we’re close if more sandpaper or caulk is needed to complete a job. Plus we’re here to consult with on new projects and to perform the regular maintenance and touch-up services that we offer.